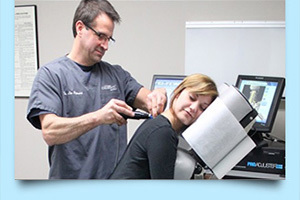 Chiropractors are now able to use highly sophisticated technology, including piezoelectric sensors and computerized interpretations, to determine the extent of abnormal motion dynamics of verebrae and other joints and soft tissues. 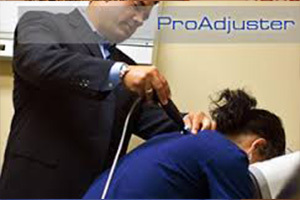 In terms of chiropractic adjustments, the Pro-Adjuster uses a precise oscillating force with uninterrupted motion. Have you ever seen a woodpecker tapping on a tree? The Pro-Adjuster taps in much the same way but uses comfortable soft tips and delivers force in a sub-harmonic, metered, and precise nature. Pro-Adjuster treatments are considered to be very comfortable. Patients are usually seated in an upright specialized chair and treated in this neutral position. Neurologically, the Pro-Adjuster takes advantage of the interplay of type 1,2, and 3 mechanoreceptors with the type 4 nociceptors generally creating an inhibition or reduction in pain. Patients suffering from neck pain, headaches, back pain, sciatica, extremity joint problems or overuse syndromes, accident or sports injuries, and many of the arthritic or postural stress complaints have reported considerable success with chiroprctic treatments.